Non-fiction – Kindle edition; Finch Publishing; 240 pages; 2013. Review copy courtesy of the publisher. 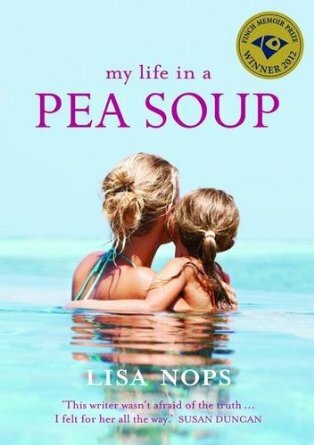 I have to confess that true stories about motherhood and raising children aren’t normally my cup of tea, so it may come as some surprise that I chose to read and review Lisa Nops’ My Life in a Pea Soup when the publisher pitched it to me. However, I quite like memoirs written by ordinary people thrust into extraordinary circumstances, and I also like tales about expats, and this book ticked both those boxes. The memoir is written by Lisa Nops, an Australian teacher who married Michael, an English civil engineer, in 1989. Michael’s job often involved working in exotic locations, so at various times the couple have lived in Australia, New Zealand, France, Malaysia, Sri Lanka and Bahrain. When they decided to start a family Lisa was unable to fall pregnant, so four rounds of IVF treatment ensued, with no success. Then, in November 1997, she fell pregnant naturally and their daughter, Sally, was born in 1998. Initially, Sally appeared to be a normal baby, albeit with an extremely quiet disposition, “inclined to sleep over and above doing anything else, not just at night but during the day as well”. But as time progressed Sally failed to meet ordinary developmental milestones, such as crawling, walking and speaking, was plagued by various illnesses, including ear infections, was prone to “staring intensely at objects and shadows” and began to flap her hands uncontrollably when excited. When she was three, she was diagnosed with an unknown “neurological problem” that would require intensive speech, language and occupational therapy. There was the very real possibility that she would never learn to speak in sentences. Eventually she was diagnosed as autistic. The book charts Lisa’s struggle to find out what was wrong with Sally, a journey that spanned several years — and continents. It was complicated by two factors: Lisa’s inability to fully accept that Sally’s slow development was anything other than her just being slow, and the family’s constant moving from one country to another. Even when Lisa moved back to her home town of Canberra, Australia, to give Sally a better chance of medical care, things weren’t always straightforward. It certainly didn’t help that Michael remained behind in Sri Lanka to continue working, leaving Lisa to grapple with raising a child with special needs alone. It’s a different county to the one they had expected, where the countryside is flat and the people speak with guttural inflections. For a while they resent their holiday there; it wasn’t what they had planned and everyone in Italy is having a great time. But, little by little, day by day, they start to enjoy the country’s level plains, the windmills and tulips. They surprise themselves by eventually liking this holiday. I do not have children, but what this book confirmed to me is the very real challenge that parents of autistic children face on a day to day basis. It’s not a grim read — indeed, there are many chinks of light in it, especially when Lisa and Michael discover (and then adopt) a program called Son-Rise, which helps Sally enormously. It’s written in a straightforward style, free of sentiment and self-pity, and I suspect readers with autistic children, friends or relatives will learn a lot from it. Nops also has a lovely way of describing life as an expat, especially the excitement (and apprehension) of moving to a new country, discovering new cultures and adjusting to their customs, and she skilfully interleaves this detail into her story with a lightness of touch. I liked the way the author explores this sense of “otherness”, not only as an expat but as a parent of a child with special needs. My Life in a Pea Soup won the Finch Memoir Prize in 2012.